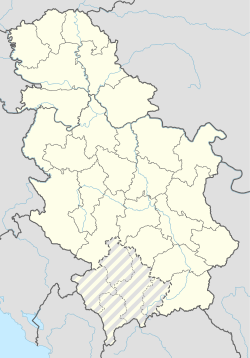 Donja Gorevnica is a village in the municipality of Čačak, Serbia. According to the 2011 census, the village has a population of 877 people. Jovan Kursula (1768–1813), Serbian revolutionary. Obren Pjevović (1919-1991), Serbian composer. ^ Marković & Pantović 1996, p. 119. Marković, Radul; Pantović, Miloljub S. (1996). Donja Gorevnica: zemlja i ljudi. Odbor za proučavanje sela SANU. This page was last edited on 22 July 2018, at 10:12 (UTC).